A cowhide rug adds an unexpectedly luxurious texure underfoot. 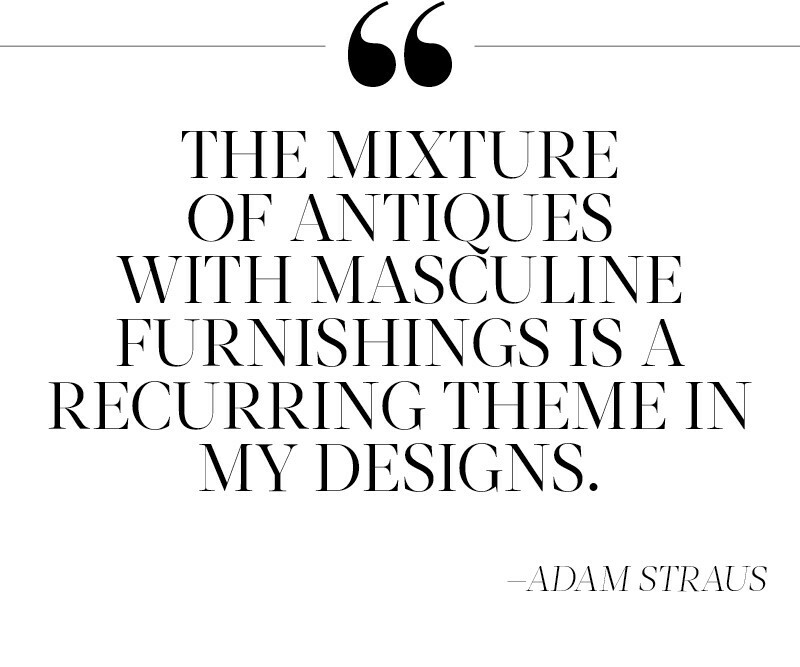 "My space evolved by curating a collection of rare, vintage interior pieces that communicate a rich, masculine mood," says Straus. 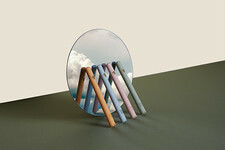 Photography by Patrick Cline. Original text by Shawn Gauthier. As a teenager, Adam Straus commissioned built-in cabinetry for his bedroom. And when he wasn't pleased with his contractor's plans, he redrew them himself. "I remember saying, 'No, I'd like more symmetry,'" he says. "The contractor said he'd never worked with anyone so detail-oriented...And I don't think he meant it as a compliment!" 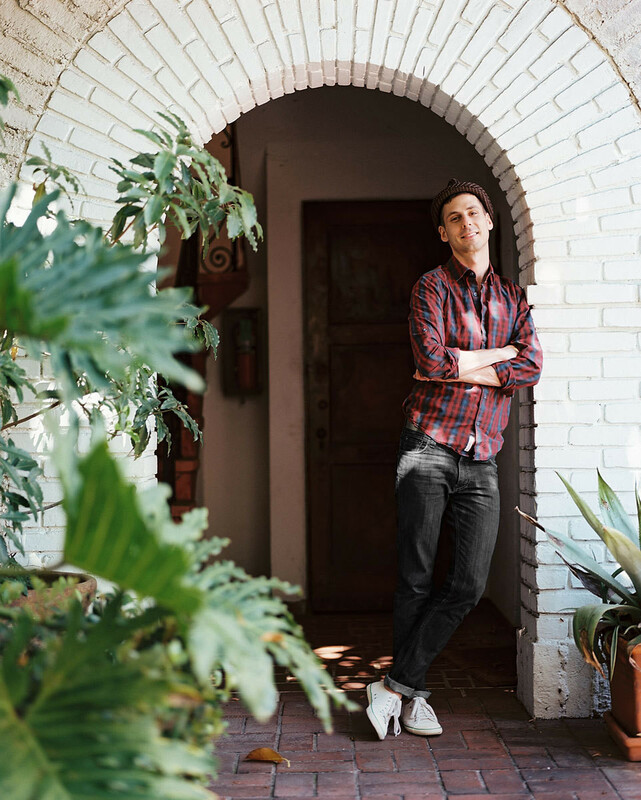 Designer Adam Straus outside his apartment building in the Hollywood Hills. 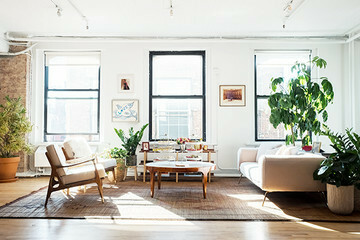 A life-size oil painting juxtaposes a contemporary sofa and a vintage cocktail table. It comes as no surprise, then, that Straus eventually landed in design. 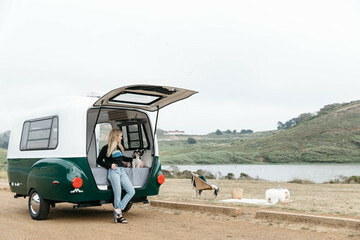 Currently principal and founder of Adam Bram Straus Design, he began his career in 2003 as an office assistant at Los Angeles-based Kenneth Brown Design. "I was eager to learn," he says, "hungry to participate, patient, and humble. I was with them for eight years, and I couldn't be more grateful." Clockwise from top left: This wooden dragon stool is an example of Straus' collection of opulent travel finds; a mid-century chair from Fuller + Roberts Co. brings organic appeal to the living room; Straus added humorous touches by taking items out of context and placing them in unexpected pairings; the custom-made mirror in the entryway gives the illusion of another room and "makes the entire space feel more alive," says Straus. 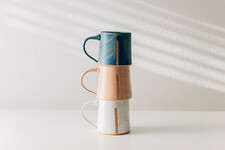 This minimal table lamp, one of a pair, was found at a local flea market and was created from a vintage wallpaper roller. 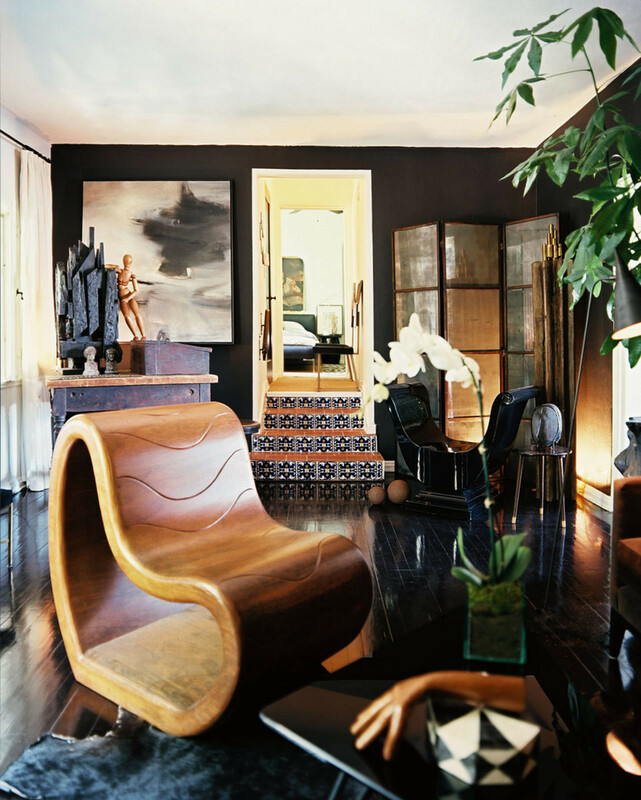 To acheive a masculine, streamlined look, Straus ebonized his hardwood floors and painted three of his living room walls a deep charcoal. Stairs lined in hand-painted Spanish tiles lead to the master bedroom. sense of whimsy and history, such as sculptural busts. such as deep browns, charcoals, and blacks. dramatic content, tones, and colors. ceiling lights and chandeliers, table and floor lamps, sconces and picture lights, and candles. such as velvets and mohairs in deep colors. Light-colored walls and sisal carpeting lend the bedroom a relaxed, fresh feeling. An antique fresco is propped against the wall. 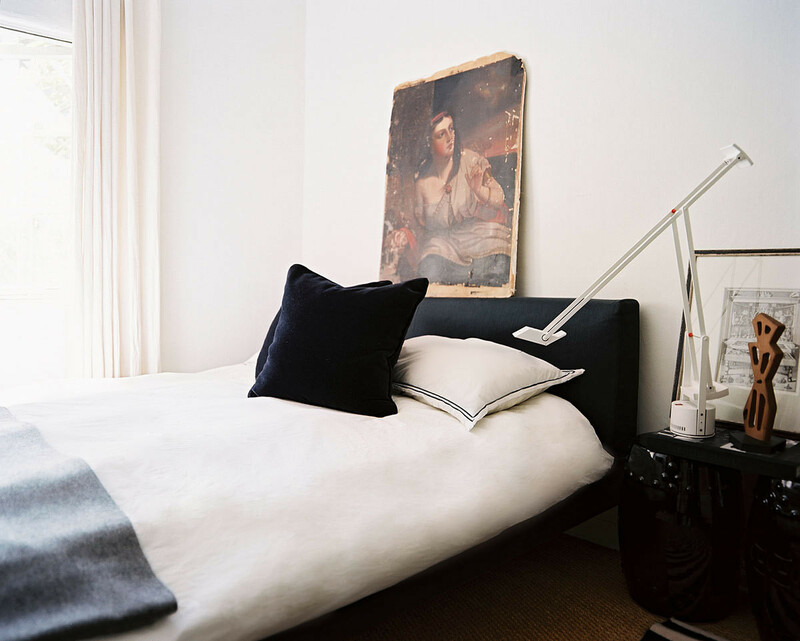 "Leaning art against a wall creates a less formal, gallery-like vibe," says Straus. During that time, Straus moved from office assistant to director of the firm while cultivating his aesthetic: mood-evoking interiors that pair classic lines with eye-catching subtlety. 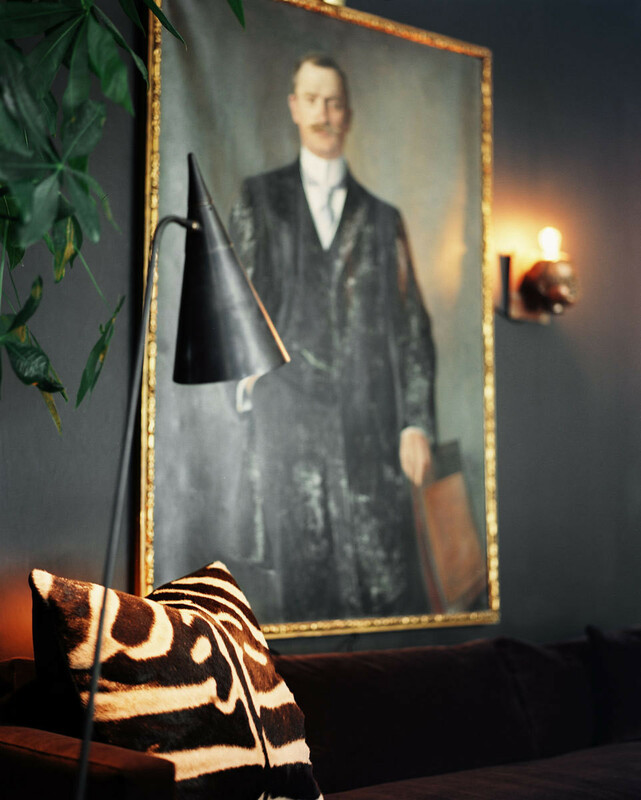 When he spotted an apartment in a historical building in the Hollywood Hills, Straus knew it would make the perfect backdrop for his style. "I saw the potential to juxtapose traditional Spanish architecture with the modern elements of my design sensibility," he says. So, he signed on the dotted line and made the move." Clockwise from top left: In place of a bedside table, Straus used a pair of glazed ceramic garden stools; "A bedroom with a sitting area feels warmer and more inviting," says Straus. "It feels like a hotel suite. "; vintage books continue the thoughtful feel created by Straus' curated collections; always reimagining and reinterpreting, Straus suspended an antique charcoal portrait from a birdcage stand. 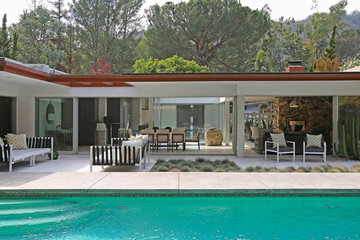 Don't be afraid to mix modern and mid-century pieces with traditional furnishings. Stick to a palette; color can unify an interior with a range of styles. Coordinating fabric tones and wood and metal finishes create a cohesive look. Vignettes offer terrific opportunities for combining various styles. Less is more. An edited, uncluttered space will feel composed and focused. As Straus mixed deep charcoal walls and high-gloss finishes with original architectural detailing, his vision of high contrast emerged. The pairing of mid-century pieces with vintage artwork and contemporary accessories resulted in a regal, collected vibe. It's a space that speaks to the talent of the designer: though he's only lived there three years, his keen eye for an evolved environment makes it appear that he's been there a lifetime. 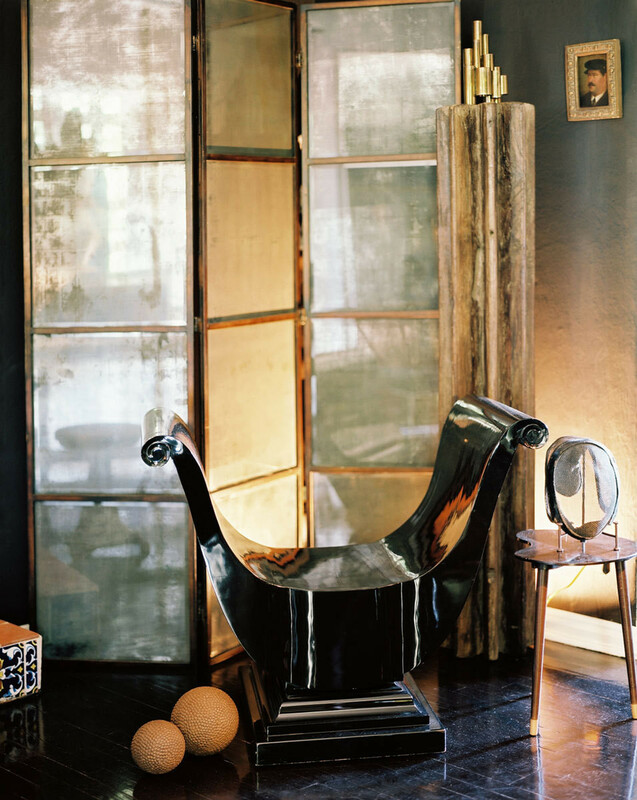 A black lacquer bench, an antique mirror, and a steel screen round out Straus' reading area. The French chandelier adds a delicate touch to Straus' office. "I like to strike a mix between worldly and modern furnishings," says Straus.